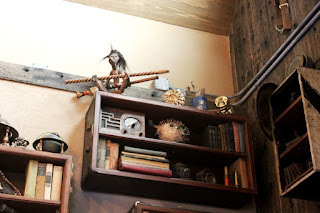 Jock Lindsey’s Hangar Bar is a trove of artifacts and curiosities from his piloting days and his adventures with archaeological adventurers, namely Indiana Jones. To get more specific, there are many nods scattered throughout the hangar that are direct pulls from the original trilogy of Indiana Jones films. Over time it appears that Jock grew weary of accepting things that belong in museums as payment for his services, or drinks, and erected a sign that artifacts would no longer be considered a form of payment. That doesn’t mean there aren’t some wonderful pieces to ogle while you’re there. Today, however, let’s stick close to where it all began, and unearth some artifacts from Raiders of the Lost Ark. We first come upon Indy in the jungles of Peru, where he using field notes from another archaeologist, Forrestal, he is seeking to locate the Chachapoyan fertility idol. The figure depicts Pacamama and is found by Jones in the Temple of the Chachapoyan Warriors. However, just as soon as he acquires to idol, Belloq steals it away from Jones. With the help of his trusty pilot, and our barkeep, Jock, Indy is able to fly away to adventure another day. The idol, meanwhile, has a story that continues on. Belloq, on his way to uncover the Ark of the Covenant, sells the idol in Marrakesh to an antiquities dealer named Saad Hassim, the one place Jones knows Belloq can unburden himself of the idol. It is here that Dr. Jones is later able to acquire the fertility idol and present it to the National Museum. At a gala in the idol’s honor, a band of Hovitos, and possible decedents of the Chachapoyan, steal back the idol and head for Brazil. Jones gives chase and confronts the Hovitos, and their Nazi counterparts, and is able to once again obtain the idol. It is clear that at some point after this adventure that Indiana turns the idol over the Jock. Whether it’s for safe keeping, because a hangar in central Florida is the last place you’d expect to find a Peruvian fertility idol, or to pay for safe passage to and from another adventure, the idol ends up in Jock’s hands. You can find it atop a trunk turned makeshift bookshelf in the very back, right corner of the Hangar Bar. Before Indy was able to collect the idol, however, he had another adventure that was the main thrust of Raiders of the Ark. His quest to get to Tanis and locate the Ark of the Covenant takes him to Nepal in search of Abner Ravenwood. Instead, Jones finds Abner has passed away leaving the artifact he is looking for, the Headpiece to the Staff of Ra, has been passed to Abner’s daughter, and Indy’s estranged love interest, Marion. Briefly in the hand of, and burned into the palm of, Arnold Toht, the headpiece contains instructions on the precise height for the staff of Ra. However, with only the information on one side, the Nazis end up with a staff that is too tall for the map in the Well of Souls and with a dig site in the wrong location. With the original headpiece in the possession of Indiana, he is able to locate the Ark first, only to have it, once again, swiped out from under him by Belloq and the Nazis. He and Marion are eventually able to attain the Ark again, only to have it spirited away by the American intelligence services. Meanwhile, either Marion or Indy accidentally left the Headpiece to the Staff of Ra at Jock’s place after a night of frivolity, and maybe one or two too many Jocktails... If you’re looking to claim this artifact, or just admire its craftsmanship, then you should definitely look very closely at the Lost and Found case in the hangar. The case is along the walkway to the restrooms and, aside from the headpiece, it contains a wealth of wonderful items that are sure to interest you. Jock Lindsey is in the conversation for one of Indiana Jones’ most stalwart companions, right up there with Sallah and Marcus Brody, and their years together show through the sheer amount of artifacts found throughout the Hangar Bar and notes from the flight log, aka menu. 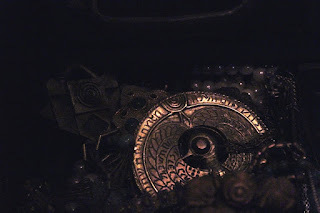 The fertility idol and Headpiece to the Staff of Ra from Raiders of the Lost Ark are only the beginning of the relics left behind from their adventures. This only means we’ll just have to keep visiting Jock’s in order to excavate new stories from the barkeep and pilot’s home.